With an adorable niece like Reese, I can now splurge on girly scrapbook items when the urge strikes. Earlier this month while visiting a local scrapbook store in Evansville, I came across the new My Mind's Eye "Alphabet Soup" lines. I loved the boy line and knew it would work well with photos of our boys. But, the little girl line really caught my attention. It was the first time I have bought a whole line of something "girly" with Reese in mind. But if you saw the growing supply of photos I have of this kid, you'd understand! 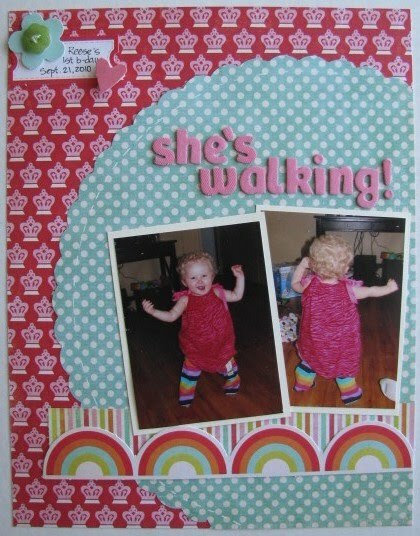 With new photos from her first birthday in hand, I set to work on a layout using two photos of her walking. It's a simple layout using a mix of patterns and diecuts from the kit. For the title I used Thickers that I found in the same store for half-price. When I scrap Reese layouts that aren't for the boys' albums, I scrap 8-1/2"x11". For this next layout, I had too many photos for a single page, so I made a 2-page layout. I cropped all five of my 4x6 photos. The die cut circle border down the center and the doll and flower die cuts are adhered with pop dots to add dimension. To add a bit more dimension, I used my old bottle of Stampin' Up's Crystal Effects to accent my flowers, the circle in the border strip, and the dots on the doll's dress. I love this effect. I'm going to be using this little bottle a lot more! As I am recovering from my surgery, I am feeling better for the most part. Since I'm not able to lift anything or strain my neck, I have been rotating my time between napping/resting, editing photos (it's a loooooooong process! ), and scrapping. However, I feel as though I am doing everything in slow motion right now. She's so cute! Great layouts! I started editing pics from this summer to post on my blog, it is a long process! Have a good evening! Cuuuute LO's! I love the birthday one! I got the Alphabet Soup boy line but I haven't had a chance to use it yet. It is sooo cute though! It must be nice to scrap with Pink :) These are adorable. Love the She's Walking one! !